Here’s another Halloween quilt that’s been on my to-do list forever. Several years ago, my BFF Brenda made one for her DGD and I fell in love with it. I already had a stash of Halloween fabrics, but had to buy the book so I could make my own. This was such an easy and fun quilt to put together. It’s a log-cabin design that uses 3-1/2” inch strips. I started cutting and piecing on Sunday. By Sunday evening, I had finished sewing all 36 blocks. After my 13yo DGD helped me arrange the blocks, she wanted to make sure it was big enough to cover her, so she laid down on the blocks. It’s much bigger than I originally thought, and it’s perfect for her 5’6” height! By Tuesday, I finished sewing the rows, and tomorrow I hope to sew on the borders. DGD hopes I can finish it by Halloween; but, if not, she says she’ll sleep with the top until I can get ‘er done. I guess I’d better get going! And, yes, I’m still working on my Happy Halloween Scrappy Stars quilt and am planning to have it finished on Friday. I’m crossing my fingers on that Friday finish because tomorrow is a no-quilting day. My BFF Brenda and I are having a girls’ funday, first meeting up for breakfast then spending the day at Disneyland! Finally getting my quilting mojo back and this scrappy Halloween quilt is officially my first quilt for 2015. It’s a work in progress (WIP) but I have finished making the star blocks – all 40 of them! Yup, that’s enough for two quilts. 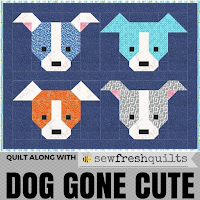 The pattern for this is from American Patchwork & Quilting October 2014. I know, I know, Halloween is less than 2 weeks away so have to really scramble to get one finished in time. 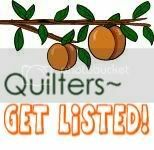 Then I need to work on two quilts I want to make for Christmas gifts. Yikes, time is flying by way too fast! Remember, the best things in life are quilted! After so many years away from quilting, I’m on a roll now with three more finishes! That stack of unfinished tops came to the rescue one more time, in a big way. These three little guys are my BFF Vivian’s grandsons. The two are fraternal twins and the one is a year older, but all celebrate their birthdays in October. Another last minute invitation prompted me to grab 3 of the tops, which made it possible for me to finish the 3 quilts in time for their party earlier this afternoon. The two quilts are from Ursula Reikes book “Even More Quilts for Baby” and is the H-Block pattern. The third quilt is the ever-popular Warm Wishes pattern. I was thrilled to see the smile on their faces; and mom was so touched she had tears in her eyes. And that’s why I quilt! Not sure if anyone is still checking my blog, but if anyone is still out there, hello! After 5 years of being away, I’ve decided it’s time to come back. Life is full of changes, with many highs and lows. And, let’s just say, I took a leave of absence to focus on my eBay business to supplement my income, which became necessary once I retired. Luckily, last year we were able to refinance and that made a world of difference. I am thrilled that my life no longer revolves around eBay and that I now have time to really enjoy my retirement and get back to my quilting! 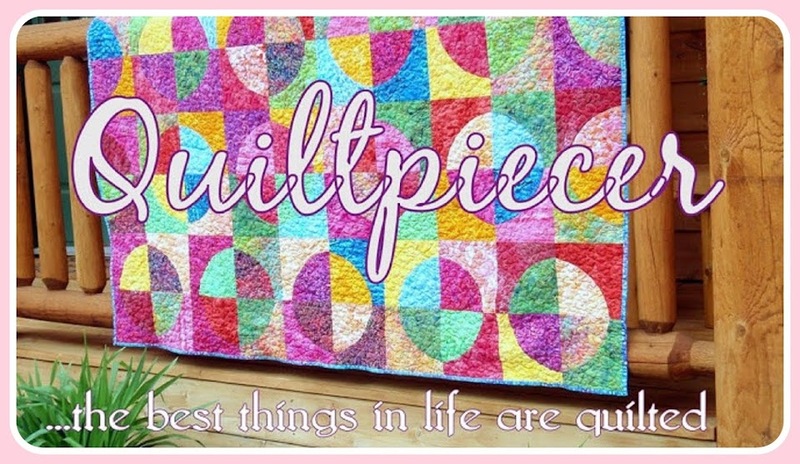 I can’t believe the quilt pictured at the start of this post is the first quilt I have finished since 2010. It is one of the quilt tops I mentioned in my previous post and is the second one in the stack. I must confess that I did not actually make the quilt top, but bought it on eBay with the intention of finishing and donating it to charity. 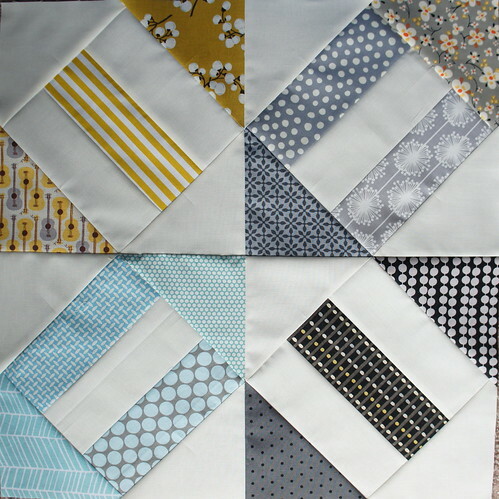 The block pattern is a vintage design named Crackers. 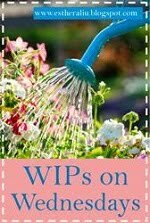 And, if you are interested in making your own, just click on the picture for a free tutorial from Cut to Pieces. I suppose it’s a good thing I never got around to quilting any of these tops – which are destined for charity – because then I would not have been able to create a last-minute special gift for my friend’s granddaughter, who was baptized last week. Luckily, I had already started quilting the stack of tops, and I chose this one for Ariana. I finished binding and labeling the quilt that Saturday morning. As you can see, she was one happy little girl! 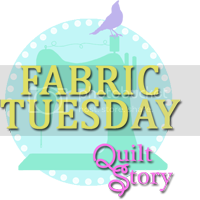 Now that I’m getting my quilting mojo back, I hope to blog on a regular basis and look forward to reading all about your quilting adventures! I’ve been creating kids quilts for Project Linus since 2001 and have donated close to 50 quilts. But over the last couple of years, I really haven’t made any quilts to donate. And I am very jazzed because … I lost another half pound! It doesn’t sound like much, but I’m amazed that I haven’t gained cuz I’ve not been very good. I’ve been eating some things I shouldn’t and I haven’t been exercising. On a subconscious level, I must be doing something right. I do know we’re eating more fish and fruits & vegetables. But it’s all okay … tomorrow’s another day and another opportunity to do right. Striped Quilt Challenge … Top is Finished! Last week I posted here about the Striped Quilt Challenge that Beth at Love Laugh Quilt has been hosting. And, I believe today was the last day of the challenge, although I don’t think a finish was “required”. It’s all about having fun and quilting! I managed to get this small quilt top finished, and I’m pretty happy with it, especially since I had a limited stash to work with. I do like how the stripes make the pinwheels look like they’re moving. Not so much in the picture, but in person they almost make you dizzy if you stare at them too long. I hope to have it finished by end of this week. Hope everyone has a wonderful Labor Day holiday! Happy September! Does This Happen To You? How many of you have the same problem I do with taking pictures of quilts? I always struggle with this. Should I place it on a bed? What about the floor? Or maybe a chair or a couch? I know! Wouldn’t it be better if I can get someone to hold it up for me? Oh, sure it would, but around my house, that’s like pulling teeth! So, if I’m lucky enough to snag DH or DS for the job, I’d better be super quick and not take too long! Or else this happens: see picture above. 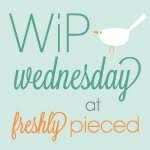 No weekly finish today, but lots of WIPs! I’m so glad September is here and school has started. I’m looking forward to the fall season and cooler weather. Have a great weekend! 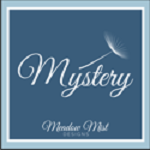 Welcome to my blog...my online journal where I share my quilting journey and the things that inspire me. Thank you for stopping by, and I hope you enjoy your vist. I enjoy meeting new friends so won't you please introduce yourself by leaving me a comment? MCM 151: Teaching, Quilting, and Piecing – Oh My! I heart the Moda Bakeshop!